Microservices are very dynamic, and the platform has seen an enormous development in the last couple of years; its components complement the modern day needs that have led to its emergence as an irreplaceable part of the industry, especially in those that deliver Internet of Things (IoT). Microservices come with an architectural style that structures an application as a collection of flexible services, which can then be individually implemented according to the business’s needs. The architecture promises a continuous delivery of large, complex applications; these flexible architectures enable organizations to evolve its technology stack over time. Microservices are increasingly being preferred to create enterprise applications due to its distinct advantages. In today’s world where possibilities are immense and ever-evolving, one cannot sit back and relax after building a single platform. It has to evolve and be ready for future needs continuously. Microservices give ample options to be progressive—this includes flexible architecture, precision, and speed; it has such a structural advancement that other platforms seem obsolete in comparison. Situations such as mobile app development employ unintelligent sources that used to rely on manual human interference. The lack of expertise in systems such as those used to slow down the whole process. 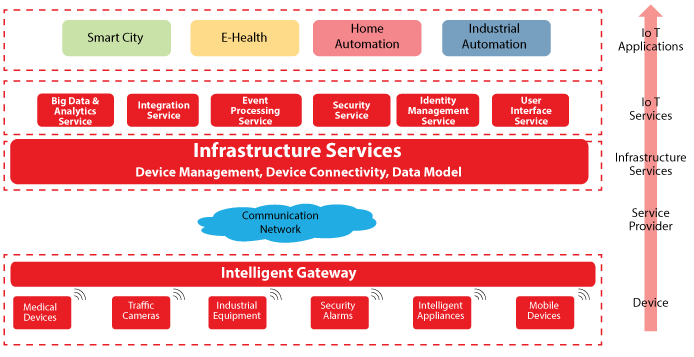 Given the apparent drawbacks of the obsolete systems and lucrative benefits of microservices, it seems that microservices are going to become an inevitable platform for the choice of architecture for developers, in the world of IoT, shortly. Microservices have faced several criticisms for being inappropriate for certain DevOps cultures, but, they stand very feebly against the likely benefits of the microservices; this is exhibited through the broad adoption of microservices across numerous world-leading industries. Modern-day tech-giants and large-scale online services providers such as Amazon, Netflix, and Twitter have all moved forward from their old technology to microservices-driven architecture — this allows the companies to scale to their size, make predictions and form strategies on-the-go. Microservices enable the IoT deployment to be fluid and to ensure that the need of the hour is met with an appropriate resolution. 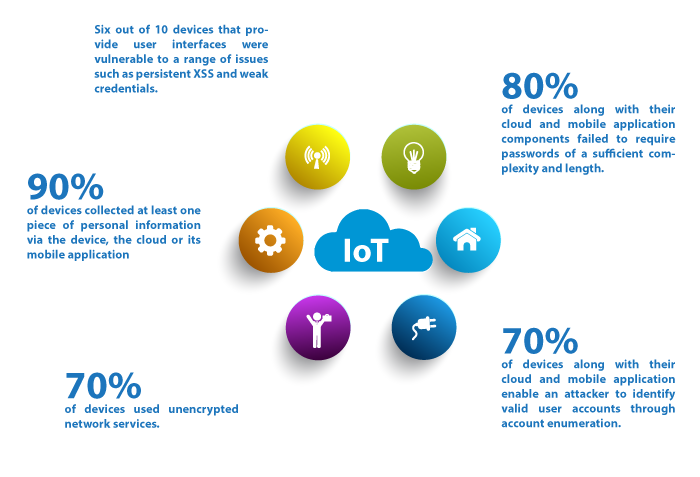 The IoT infrastructure generally requires immediate decisions to tackle challenges for successful deployment. Microservices allow a system to operate independently where the entire technology stack need not be disturbed to test new ideas/products. Due to its scope for multiple deployments, each operation can take numerous trials at once. Earlier alternatives did not provide us with such flexibility, and, therefore, the evolution process was much slower. Microservices allow upgrades in which each step results in fine-graining of the concerned product, helping us obtain the maximum value. One of the main highlights of microservices is the flexibility it extends to developers. We can leverage microservices for testing and retesting without having to disturb the whole mechanism. If the checked item isn’t working, we can perform substitutions with something better. In this way, microservices not only allow ready testing but also makes the evolution process flexible – the rectification of one branch does not disturb the whole tree of the process. In this dynamic digital world, technology is always developing and becoming superseded by more sophisticated and cost-effective alternatives. One big advantage of having microservices in IoT is that they both can adapt to these dynamics. The microservices structures tackle obsoleteness by replacing outdated nodes and introducing net structures to fill the gaps – this makes the process fluid and cost-effective. By bypassing the unnecessary tasks, microservices allow one to test innovative ventures quickly – much needed for a progressive future. Assembling a solution through microservices allows one to adjust and iterate; this can be done even without having to re-architect the entire system. Most mobile and web application developers find it beneficial to apply agile development, and older options did not allow this scope of isolating risks. The continuous microservices will enable one to move towards the finish line and connect all the APIs needed, one by one, without having to increase risk. All of these perks come up as we deploy microservices. The dynamic future doesn’t tolerate obsoleteness nor does it want to slow down. Microservices allow unlimited customization and overall faster operation in their environments. The lower cost and risk reduction introduced by microservices is motivating many organizations to make the upgrade.